Children and families love exploring the natural, wooded environment of our campus, which makes the nature program rich and accessible. 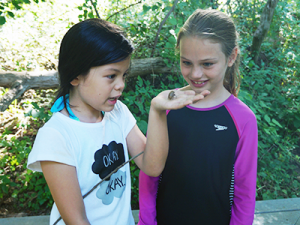 We use the forest, rocks, stream, and wildlife on the grounds to teach ecological awareness and appreciation for the natural world. Over the years, children have delighted in exploring in our creek and the Bamboo Forrest. The bird blind is also a favorite spot as campers join the bird watching club to listen and observe the feathered creatures in our woods.